After saving someone’s life by donating bone marrow three years ago, Mt. Olive native Josh Weiss is raising awareness about bone marrow and being part of the registry. On Dec. 3, three years to the date that Weiss gave bone marrow, the 30-year-old Rockaway Township resident posted on Facebook about what he did in 2015. Weiss’s journey to donating bone marrow began back in 2013. At that time, he was living with his aunt in Bloomingdale. He would read the newspaper everyday and one morning saw an article about a bone marrow drive. It was for Anthony Daniels, a 19-year-old hockey player from Ridgewood who had cancer and needed bone marrow. Daniels’ story hit home for Weiss because like him, he played hockey. So, he quickly decided to register. While he didn’t know too much about bone marrow, he did basic research and was told if he matched with anyone, he would be notified. A couple of years later, he received a call saying he was paired up with a 68-year-old man. He had a physical done to make sure he was healthy enough to donate. 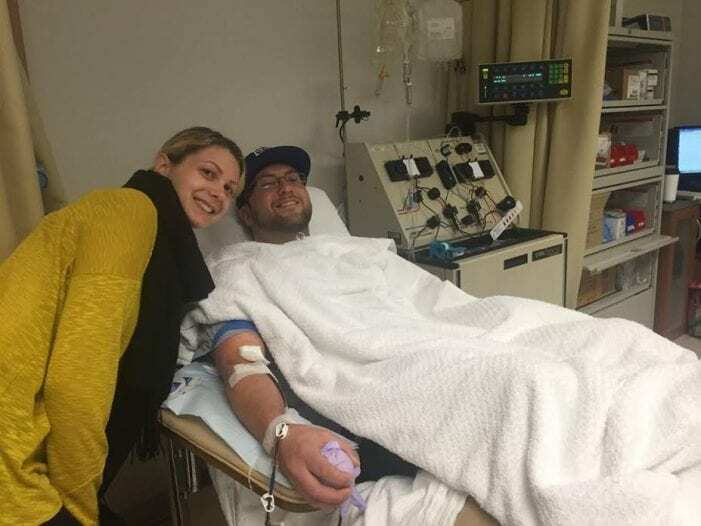 Once given the go ahead, he had two options; Peripheral Blood Stem Cell (PBSC) donation or liquid marrow. In PBSC, a machine draws blood from one arm, extracts the cells it needs and returns the remaining blood through your other arm and in the latter, liquid marrow is withdrawn from the back of the pelvic bone with a needle. Being that he had a bad back because of hockey, doctors chose PBSC. Weiss explained that the whole procedure took about five or six hours. Besides feeling a bit of tingling in his hands, he was at ease with his girlfriend and now fiancée Ariel Auriemma at his side. Weiss, an avid skier snowboarder, who works with computers, explained that many of his friends didn’t know he gave bone marrow and some even had misconceptions about it. According to Weiss, many people believe that donating bone marrow can be painful and scary. While it is the exact opposite.